An Excisioner — a practitioner of dark, flesh magic — invades the cottage and rips Thane’s heart from his chest. To save her teacher’s life, Ceony must face the evil magician and embark on an unbelievable adventure that will take her into the chambers of Thane’s still-beating heart—and reveal the very soul of the man. Although I was dismayed by the romantic nature of this book, the overall premise was quite agreeable. I honestly judged a book by it’s cover, or rather its title. The Paper Magician. Intriguing, no? I quite like magic, so the title spoke to me and I decided to purchase it. It was set in the early 20th century, although there was almost no world building. Outside of the magician’s home, the reader did not get to experience much of London. There seemed to have been very little research into the customs of the time or manner of speech. At times, modern colloquial terms and slang would be used in the book which made it more difficult to believe the time period.The reason why Ceony was sent to Magician Thane? Folding, or paper magic was becoming a dying art. In the modern age of emails, texts, and instant communication – that is completely feasible. Where once one would sit down with a quill and some paper, now to correspond with acquaintances they just need to tap away at a keyboard. Bookstores adorned every town, filled with pages and pages of the most fantastical stories or tales – suddenly closed and those same stories now in digital form. The absolute necessity of paper is being replaced by technology and that would translate wonderfully well into the plot of the book. But in the early 20th century, why is paper folding a dying art? Unfortunately, we never find out.The idea of individuals, or magicians, bonding with a man made thing (paper, glass, etc) was interesting although unfortunately not developed well enough. I would have loved to read about the different crafts, learn the extents of the magician’s abilities with each material, and be able to develop my own love of (or desired affinity toward) a material. Personally, I love the idea of being able to harness one of the elements – air, fire, earth, water, or spirit. An author could write a beautiful description of a water user bending the liquid to their will or soothing injuries, giving the reader wonderful ideas and showing them the possibilities of the element. 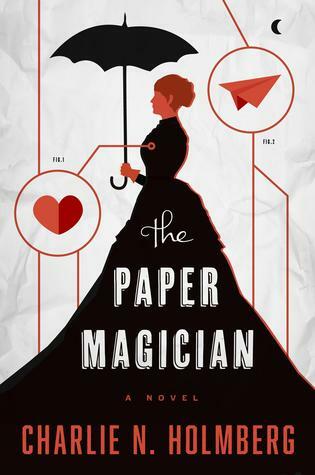 This author just made me want to do some origami, which don’t get me wrong is beautiful but all of her descriptions of the “magic of paper folding” was just that… paper folding. She did a half fold here and a dog-eared fold there. Don’t get me wrong, the final results were sometimes amazing – like a human-sized paper airplane with convenient handholds. Who wouldn’t want to fly that? I would have loved a short chapter just dedicated to the various crafts – a magician 101 if you will. For example: Magicians who work with metal are called Smelters, they can craft bullets that never miss their mark. Those who deal with paper are called Folders, they can breathe artificial life into paper. Glass makers are called… And those that practice the darkest of magic, blood/flesh magic are called Excisioners. Overall, I really enjoyed the book and purchased the second one in the series only one day after I finished the first. It had its pitfalls, but I found myself generally ignoring them as the book really drew me in.